Most of the 9 rooms at Relais Rione Ponte overlook iconic squares of Rione Ponte, like Piazza di Tor Sanguigna and Piazza delle Cinque Lune. All rooms have en-suite bathrooms and LED HD TV. Breakfast is served from 07:30 to 10:30, in the common hall or in your room. Free Wi-Fi is available throughout Relais Rione Ponte. Feather pillows are available on request and the mattresses are hypoallergenic. We love that the bed linen is changed daily and that the bathrooms have Nuxe bath and body products. Larger and modern Superior Rooms feature a Queen bed or Twin beds. The soundproof windows overlook either Piazza delle Cinque Lune or Piazza di Tor Sanguigna. 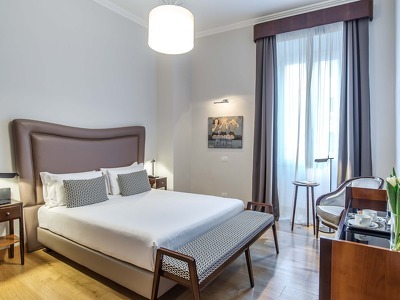 The Deluxe rooms of Relais Rione Ponte feature a King or Twin bed, or Twin beds. The bathroom is full with a large shower, Turkish bath and chromotherapy. The soundproof windows overlook Piazza delle Cinque Lune, Piazza di Tor Sanguigna, the Stadium of Domitian or Via dei Coronari. These spacious rooms can be fitted with an extra bed or cot on request. The Junior Suite of Relais Rione Ponte features a seating area and a sleeping area with a King bed or Twin beds. The bathroom features a large shower and chromotherapy. The soundproof windows overlook Piazza delle Cinque Lune, Piazza di Tor Sanguigna, the Stadium of Domitian and Via de' Coronari. The Junior Suite can be fitted with 1 extra bed or cot on request. The Suite of Relais Rione Ponte features a large seating area and a bedroom with a King bed or Twin beds. The bathroom is full with a large shower and chromotherapy. The soundproof windows overlook Piazza di Tor Sanguigna and Via de' Coronari. The Suite can be fitted with up to 2 extra beds or cots on request. 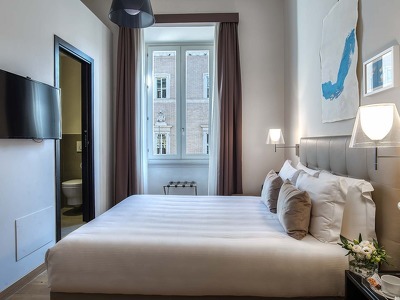 Just steps away from Piazza Navona luxury hotel Relais Rione Ponte is in the historic district of Rione Ponte in Rome. Located on the second floor of a 17th-century building you'll enjoy a relaxed stay surrounded by art; contemporary, original works of art are on show throughout the rooms. 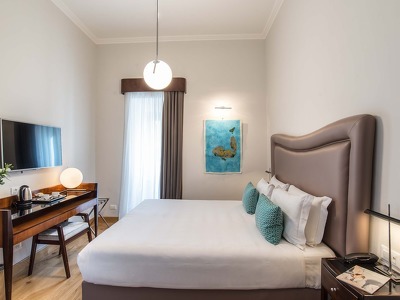 Under the artistic direction of Emmeotto (a contemporary art gallery housed in Palazzo Taverna), the owners have carefully selected Italian and international artists, whose works make the atmosphere of Relais Rione Ponte, unlike any other small boutique hotel in Rome. Relais Rione Ponte is an authentic small boutique hotel surrounded by cafés, restaurants and typical shops. The area of Rione Ponte is one of the liveliest areas of historic Rome. Babysitting can be organised and if you can arrange to visit Rome by Segway or with a private guide. Private pick up service with driver is available upon request at a very reasonable cost. (From €50,00 for a Sedan car to €80,00 for a minivan, depending on the airport). Leonardo Express: non-stop train to Termini station, departures every 30 minutes. Ticket €14 O/W, c.a. 35 minutes journey. Terravision bus from Ciampino Airport to Termini €4,00 per person. Then you could take bus 70 to Via Zanardelli stop. Sitbusshuttle: Ciampino Airport to Termini Station( Via Marsala, 5) €5,00 per person. From Termini Station: get Bus number 70 (CLODIO) for 11 stops to ZANARDELLI. Subway B line, direction LAURENTINA to TERMINI (4 stops). Get bus number 70 (CLODIO) for 11 stops until ZANARDELLI. Bus number 30 (CLODIO) 8 stops to ZANARDELLI. Private Garage: Cavour Car Park: Telephone:+390668809610, +390668890094. Open 24h/365. Rate from €2,20 per hour to €24 per day. Accepted payment methods: cash, credit or debit cards. Video surveillance round the clock. 750 metres away from Relais Rione Ponte, through Umberto I bridge. Public Parking: Lungotevere Marzio o Lungotevere Tor di Nona, legal parking spaces are delineated with blue lines which are pay-and-display. Tickets are bought at the machines on the pavement and cost €1,50 per hour, from Monday to Saturday from 8.00 am to 11.00 pm. 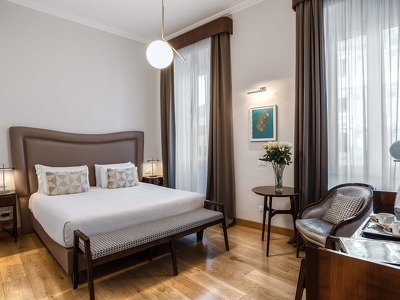 Relais Rione Ponte is located in the historical centre of Rome, therefore inside a restricted traffic area which does not allow non-resident cars to get into this area from 6.30am to 6.00pm from Monday to Friday and 2.00pm - 6.00pm on Saturdays. In the case of a no-show, 100% of the total stay will be charged. IMPORTANT: we kindly ask you to communicate your estimated arrival time, since our reception is open from 8am till 8pm. A surcharge of €30 will be applied for arrivals after check-in hours. All requests for late arrival are subject to confirmation. Very comfortable rooms, very friendly staff, and amazing location. My wife and I booked our room last minute due to an error with the hotel we originally booked, and this hotel could not have been more kind and helpful to us. We will definitely be back! Only one advice, choose it for your next trip in Roma...You are feeling there like at home. Ratio price/service is perfect and decoration nice , class and smart. I haven't mentionned the strong commitment of the employees in order to make your stay uncomparable ! Staff were helpful, breakfast was nice and the room was great. Bed was incredibly comfortable. Art was a little pretentious but hey that's a personal opinion. Relais Rione Ponte is a beautiful guesthouse (a luxury B&B) with design pieces of furniture and an excellent service. At the reception I met a lady with a degree in history and it was a real pleasure to take her tips to unlock the secrets of Rome and visit the best spots. 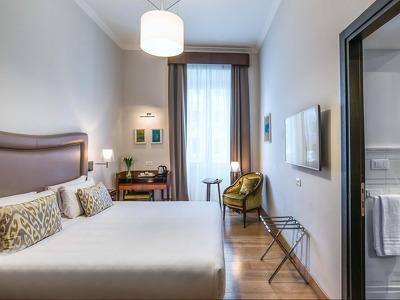 The Relais offers suites and family rooms which are unusual in Rome. Icing on the cake, the location: just in front of Piazza Navona so you can walk everywhere. I highly recommend it!